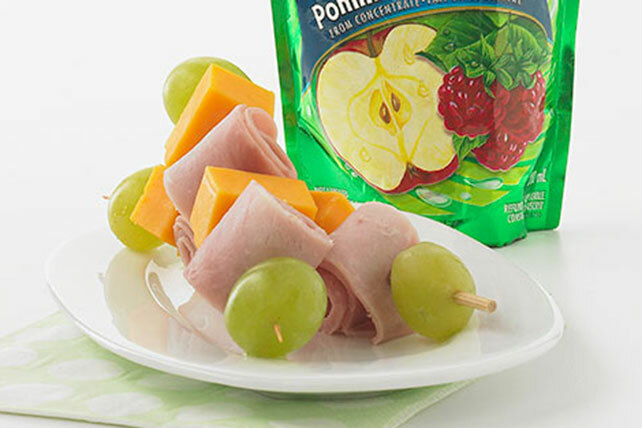 Rolled-up honey ham, cubes of Monterey Jack cheese and green grapes make for a quick kabob that requires no grilling or broiling, just enjoying. Stack ham slices; roll up tightly. Cut crosswise into 4 roll-ups. Thread roll-ups with cheese and grapes onto 2 (6-inch) skewers. Serve with CAPRI SUN Fruit Punch. Prepare as directed, using a variety of cut-up seasonal fresh fruits, such as apples, strawberries and seedless red grapes. Serve with thin wheat snack crackers or RITZ Crackers.